I first became aware of Thomas Piketty’s book Capital in the 21st Century last spring, though not from the onset of “Pikettymania” amidst its skyrocketing to the top of the best seller list. Rather, a couple of faculty colleagues brought it to my attention for its data. Knowing of my own research interests in historical tax data from the turn of the century United States, they suggested it as a new and relevant contribution with a fair amount of empirical overlap with what I was doing. I began reading the book as it gained attention for other reasons – mostly its prescriptive recommendation for an intentionally punitive global wealth tax, with rates not unlike the 75% top income tax bracket that had recently been enacted in Piketty’s native France. At the time, the scholarly and public buzz alike focused upon the prescriptive debate. By contrast, Piketty’s empirics were almost universally praised for their depth and rigor – even by writers who diverged from his ideologically-driven interpretations. Something of a watershed moment occurred in late May 2014 when Chris Giles of the Financial Times published a lengthy critique of Piketty’s data – data that had thus far attained almost nothing but acclaim. That is when I also returned to the book and began investigating its data presentations about the economic history of the United States. As regular readers of this blog know, several of Piketty’s claims simply did not add up. A little over six months have passed, with a notable development in the repeal of France’s punitive wealth tax last week. Despite this new piece of empirical repudiation for a policy that is very similar to Piketty’s core prescriptive arguments, his work remains politically popular and indeed picked up a slew of year-end book prizes, including one given by the Financial Times. Piketty’s reputation on the data front also largely withstood the Giles critique, or at least among those who were already sympathetic to his claims. Having also weighed in on the data debate myself, I began work on a formal critique of the empirics in Capital in the 21st Century. The product – an article coauthored with Robert P. Murphy – is set to appear in a forthcoming issue of the Journal of Private Enterprise and is now available for download on the Social Science Research Network via the link at the bottom of this post. ● It is important to note that Piketty’s work begins with a series of very bold data claims. Empirics are not simply the most widely praised part of the book – they are the substance of his interpretive argument. Piketty makes this abundantly clear in his introduction, touting the novel nature of his data set and laying claim to the process of “patiently searching for facts and patterns and calmly analyzing economic, social, and political mechanisms that might explain them” (p. 3). The discovery of several faults in Piketty’s data claims is therefore directly pertinent to his theoretical arguments as well, because his underlying theory is derived from claimed observations in the data. ● We echo many of the concerns first raised in Giles’ Financial Times critique, including the problem of opaque citations throughout Piketty’s empirical work. We find that insufficient citation of his sources and inadequate explanations of his methodologies are not only present – as Giles also indicated – but pervasive throughout the book. We diverge from Giles though in one key way though. The bulk of Giles’ investigation focused upon methodological differences in the calculation of wealth inequality, particularly in the UK but also several other countries that Piketty investigated. This is an admittedly imprecise area of research, though – importantly – it is also one that is still very actively being pursued. While we echo many of Giles’ concerns here as well, we note that they may be the least of Piketty’s data worries. Far more troubling, we believe, are a number of core factual misstatements in Piketty’s historical narrative, clear evidence of cherry-picking within his data presentation, and at least one case of possible mischief in his construction of an important data chart on which he bases one of his main theoretical claims, the famous “r > g” formula. ● We chose to focus mainly on Piketty’s historical treatment of the United States, as this is both the closest area of overlap between Piketty’s work and our own as well as being the focal point of the public discussion around the book for the past several months. We believe that Piketty’s U.S. data problems are symptomatic of similar issues in the other countries that he examines, and acknowledge instances of such as found by other scholars abroad. In examining Piketty’s U.S. data though, it becomes abundantly apparent that he struggles with U.S. political and economic history, including misstatements of basic factual events, dates, and data points. This particular problem extends deeply into his historical narrative of the 20th century United States, and stains his main attempt to construct and interpret a historical time series of U.S. wealth inequality. ● One of the heaviest points of criticism focuses upon Piketty’s attempt to measure wealth inequality in the United States, purporting to show a dramatic upswing in the past three decades. When first faced with this criticism back in June, Piketty largely sidestepped the issue by appealing to a new “study” by Emmanuel Saez and Gabriel Zucman that appeared to support his own claims. At the time this study existed as no more than a PowerPoint slideshow and had not been subjected to any meaningful peer review. It was nonetheless quickly embraced by Piketty and his supporters as a point of vindication for his own problem-plagued measures. The Saez-Zucman draft has since been released as a NBER working paper. While it is not our aim to dissect this paper as well, we do address its meaning for the larger debate around Piketty and raise a number of questions that do not seem to be adequately addressed in either work. ● As noted above, we do suggest an instance of likely mischief in one of Piketty’s empirical charts, used to test his famous “r>g” prediction for the global capital stock. Specifically, and as readers of this blog have seen before, Piketty quietly inserted a succession of highly questionable data assumptions from the Soviet Union and other communist countries in one of his main empirical graphs about the purported characteristics of global capitalism. This was done without any annotation, and only appears hard-coded into his source material some three spreadsheets deep. The resulting effect of this insertion created a severe distortion in the cumulative “global” index that Piketty constructs, operating in a way that directly accentuates his “r>g” thesis. Although this is not a lightly offer criticism, it is also difficult to explain or justify Piketty’s decisions on this chart through any of his annotation or descriptive notes, giving rise to the likelihood of an intentional manipulation on his part. ● In conducting this analysis, it merits acknowledgement that Piketty has made his data publicly available for outside scrutiny. Although this is an increasing common convention of economics, we fully credit him for this exercise in transparency. It should also be noted, however, that the posting of one’s data files online is not a license to impute validity to their contents and subsequent interpretation. Many of Piketty’s key charts are derived from complex and interlinked spreadsheets that require hours of patient analysis to fully dissect and understand. Even as the files are accessible, this task requires a level of scrutiny that extends well beyond the casual reader of Piketty’s book in which the same charts are presented as accurate factual representations. In reality, they are often products of highly normative methodological choices, source selectivity, and other biasing factors. We have accordingly endeavored to shed some light on a number of Piketty’s more widely touted charts including where they go astray. 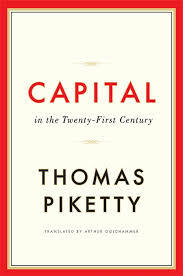 The resulting study does not endeavor to be a comprehensive deconstruction of Piketty’s work. Rather it is a detailed examination of several of his core empirical claims, with particular attention to how they are utilized to support his core arguments. While there is surely much more to be said on this subject, the examples highlighted in this paper include the empirical presentations behind several of Piketty’s main theoretical claims and function – in cumulative – to construct his overarching historical narrative of 20th century capitalism, and what he believes to be occurring in the present. Insofar as his empirics in these instances are riddled with error, bias, and possibly worse, it may well be the case that Piketty’s data analysis forms the weakest point of a highly touted but also highly problematic book.